Six works featured in this year’s Vivid Sydney festival are by past and present staff and students from the University of Sydney’s Faculty of Architecture, Design and Planning. Students from the Master of Design Science (Illumination Design) and Master of Interaction Design and Electronic Arts combined to create one of the centerpiece installations – the playful lighting system Chromapollination. The work is a showcase of digital LED dandelions. An interactive sculpture, the flowers changes colour and react to the movement of passing pedestrians. Water Droplet – a two-storey, giant fountain shaped as a water droplet. Visitors can sit inside the fountain accompanied by a calming soundtrack. “The idea was to incorporate the water of the harbour into a lighting installation,” Ms Paris said. Fellow Master of Design Science (Illumination Design) students Michael Kellis and James Nagel will present Light the Night, a guerilla projection installation. The pair will move custom-made mobile projection carts around Circular Quay and the Opera House precinct, projecting stenciled graffiti images onto public spaces. “We’re projecting graffiti onto buildings precisely because it’s in your face and it’s a creative use of light,” Mr Nagel said. Another Master of Design Science student, Ben Baxter, is entering his third installation in a Vivid Festival this year. In collaboration with Ruth McDermott, Mr Baxter has created Cumulus, a suspended metallic cloud that shimmers with reflected light from strategically placed LEDs. “We are using contrast – or gloom and illumination – to make it look like the light is flowing out of the cloud,” Mr Baxter said. Also returning to Vivid is final year Master of Design Science student Kristy Philip. With her employer, Haron Robson lighting, Ms Philip produced Infinity Squared, a geometric sculpture heavily influenced by the mind-bending work of M.C. Escher. 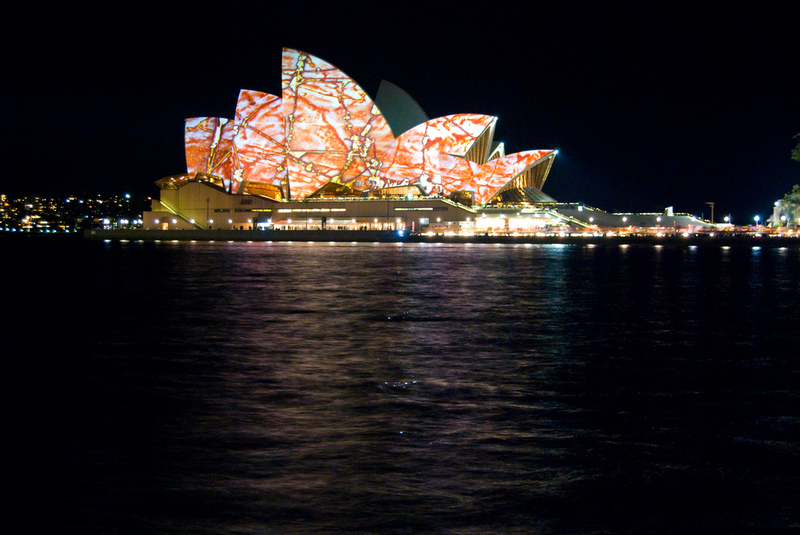 Ms Philip sees Vivid Festival as a chance to experiment with design and creativity. “It gets boring if you play it safe all the time,” she said. Fourth year Architecture student William Chan’s installation Palette of Urban Green demonstrates how sustainable design can create engaging public spaces. William is currently undertaking his Honours year after winning two scholarships and the Convocation Medal for his impressive work in the field of design. Palette of Urban Green uses repurposed wooden shipping pallets to create twisting towers filled with light. Mr Chan said the need to address sustainable urbanisation is as urgent as ever. “[The work] is a juxtaposition that encourages us to explore this relationship between the natural and the built environment,” he said.